Delivery and service was excellent. Only had the battery 3 weeks but works fine. Only time will tell if it lasts long term but have no reason to doubt it. I,m giving the 5 stars for the prompt service and technical Advice I was given when I phoned them with a query. I have not yet been able to fully test the battery but from the quality of service I received I am confident about having chosen the right battery for my needs. Excellent value, and slightly smaller/lighter than the one being replaced. Well packaged and quickly delivered. Excellent it seems to be doing a great job and holds the charge well even with the mover on our caravan. purchased to replace faulty elecsoll 110. just spent 5 nights in caravan using 28 watt solar panel in reasonable conditions battery held up well. good delivery service .have recommended tanya to anybody who ask's. Much too early to accurately rate the staying power of this battery only used on one occasion since purchase. What I can say is that it arrived, as promised, early the day after I ordered it online and that the dimensions are exactly as quoted (I did double check this by email prior to placing the order). This is the only battery of this power that I could find that fitted easily into the undersized battery compartment of my twin axle Bailey Pegasus (why are caravan manufacturers so clueless??) and I was delighted to find it. The three* rating is only given because of the short time I have owned the battery. I hope I can increase this to 5* after a more reasonable length of useage. 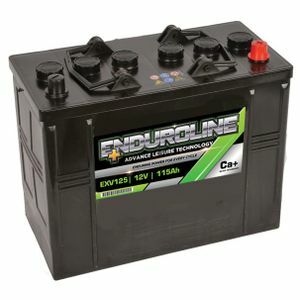 This battery has been fitted in a motorhome as the starter battery. It has only started the vehicle about 5/6 times so it is early days yet. So far my only slightly adverse comment is that it is much lighter than the similarly rated (125Ah) Elecsol battery which it has replaced. The internet ordering experience was everything it should be and the service I rec'd when collecting the battery was also first class. Battery delivered next day at 8:10 am. Good service. Excellent product. Use it for outboard motor on fishing boat, instead so rowing. Brilliant. Extremely well packaged. Fast delivery. Many thanks.